Move over overnight oats, chia seed puddings and smoothies! Now it’s all about thick and creamy smoothies loaded with toppings that you eat with a spoon instead of a straw. 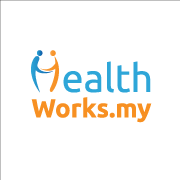 Instagram is flooded with really pretty and yummy looking shots of smoothie bowls but surprisingly, we don’t have any smoothie bowl haunts around Malaysia yet. Who shall be the first to bring in this trend? We shall wait and see! 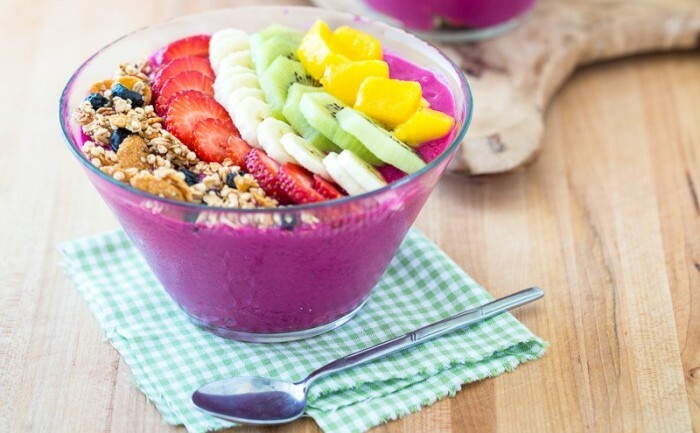 Smoothie bowls are super easy to make because you just need to blend all the ingredients together like your usual smoothie but using less liquid so you get a thicker consistency, making scooping easier. Also, you can add your favourite toppings on top to make it more filling and look more presentable for your social media outlets. Remember to add your toppings in moderation if you don’t want to tip the scales because too much of a good thing could actually go straight to your hips. 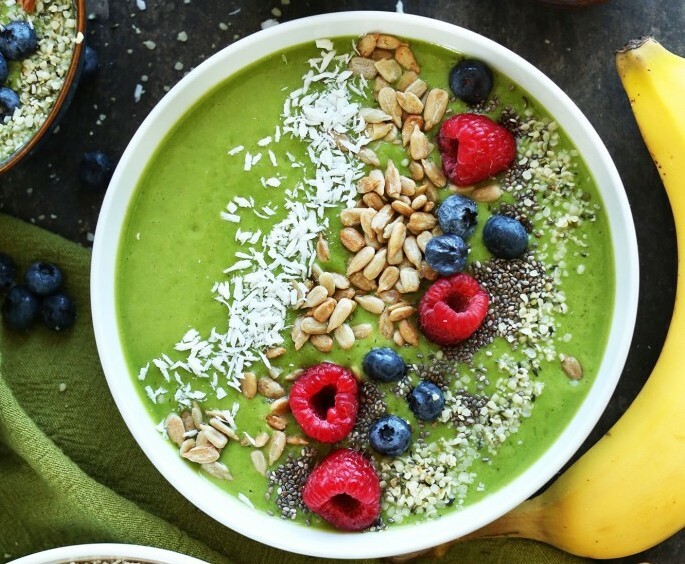 Spinach, kale and avocado is what gives this bowl its green goodness! 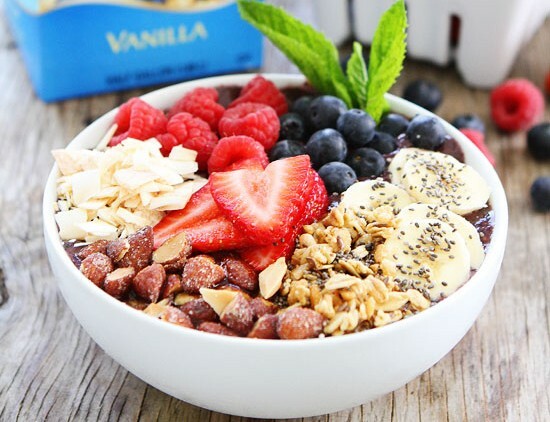 The addition of some chia seeds, coconut flakes, sunflower seeds, hemp seeds and berries makes it a fulfilling meal that will give you your daily dosage of Omega 3 and vitamins and keep you satiated until lunch. 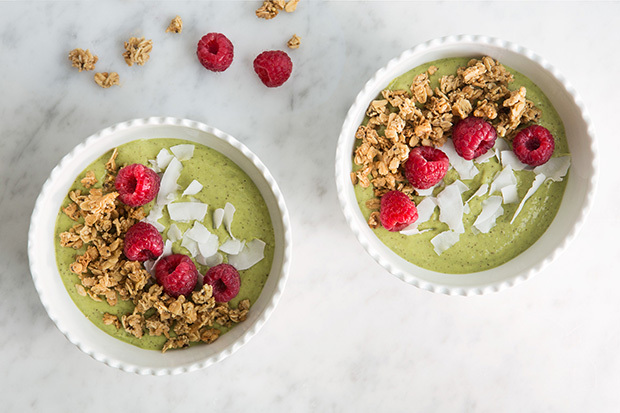 Avocado is one of the main greens in this smoothie bowl and we’re not complaining cause avocados are rich in healthy fats, fiber and they’re great for your eyes too (both aesthetically and internally). Adding a tablespoon of spirulina will add more nutrients, antioxidants and anti-inflammatory properties to the bowl . You have to soak the oats and chia seeds in coconut milk or almond milk for a lower calorie alternative for 10 minutes to overnight to soften it before you can pop it into your blender in the morning. While the ginger adds a bit of zing, the matcha powder can give you a boost of energy to get you through the day. 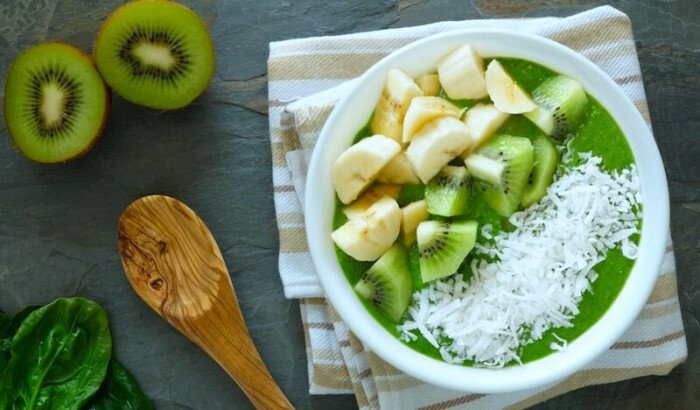 Spinach is one of the core ingredients to this smoothie bowl which is great because spinach is rich in Vitamin K that helps with your body’s calcium absorption . The frozen bananas and pineapple acts as a natural sweetener so you don’t have to worry about adding sugar. This recipe calls for a lot of bananas but we think you can omit some of it since you will get some sweetness from the dates as well. Also, amp up more greens by adding some avocado to make it creamier. You just need 4 ingredients to make this smoothie base which are almond milk, frozen fruits such as bananas and berries and fresh spinach. It’s a good way to sneak in some greens for the picky eaters because the fruits will cover up the taste of the spinach. It’s important to soak the chia seeds in water for at least 10 minutes to make it easier for your body to digest it . This smoothie will taste like raspberry ice cream and who wouldn’t want to have ice cream for breakfast? No worries if you can only find white-fleshed or red-fleshed dragon fruit, as both types are packed with antioxidants and vitamin C which is what you need for nice skin . You can replace the protein powder with some avocado for some natural plant protein. Opt for fat-free to low-fat milk to make this fruity bowl less heavy. You won’t even need to add any sweetener because you can get that from the mango since mangoes have a high sugar content. The sweetness of the mango is complemented with tart strawberries and raspberries which have very low sugar content so you sidestep the sugar high. Chocolate comes from the cocoa fruit so we’re going to stretch it a bit and count that as a fruit inspired bowl. 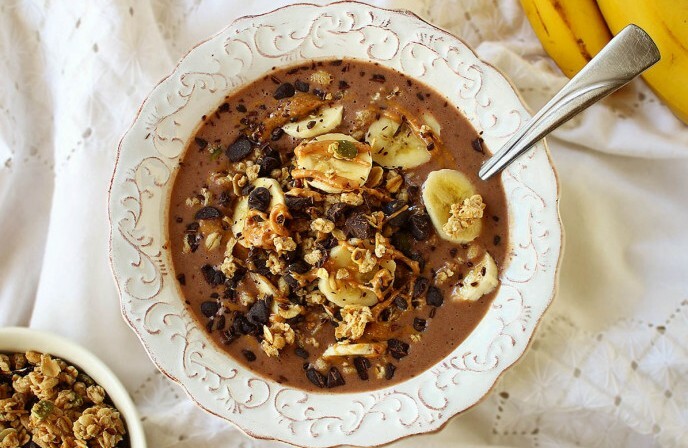 Opt for dark chocolates which contains more than 70% cocoa and pure cocoa powder to cut out the excess sugar for this dessert-for-breakfast bowl. 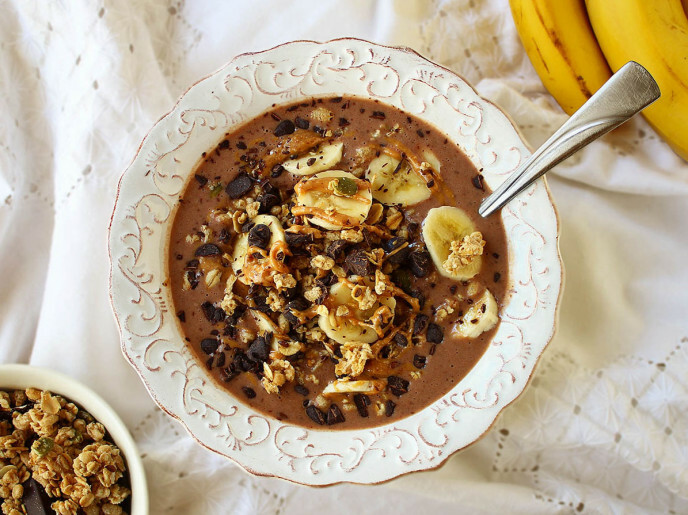 Which smoothie bowl are you making tomorrow? Let us know in the comments below or on our Facebook page!